The images from 10 years ago still break the heart: Dogs forced to be left behind in the aftermath of Hurricane Katrina, struggling to stay alive on the roofs of their New Orleans houses and frantically swimming across flooded streets. Hundreds of animal rescuers who were moved by those images made their way to New Orleans in 2004, doing whatever they could to save displaced pets. Among them were dog trainer Anne Trupo, veterinarian Lisa Hart and Amy Beichler of the Public Animal Welfare Society (PAWS Ohio), who drove down in a caravan from their Cleveland homes. They rescued 18 dogs and 12 cats, including a mixed-breed dog the women named Hurricane. Hurricane was a smart dog — he figured out how to turn on the bathroom’s water faucet, which kept him alive. Homeland Security officers alerted the women to another abandoned dog, a German Shepherd with a broken leg who’d been left in a yard with no food or water. The women drove Storm and the other animals they’d saved back to Ohio. All of these four-legged Katrina refugees found forever homes — or at least places to stay until their original owners were able to take them back. Trupo fostered and then adopted Storm. Matt Harmon of South Euclid, Ohio, became Hurricane’s dog dad. 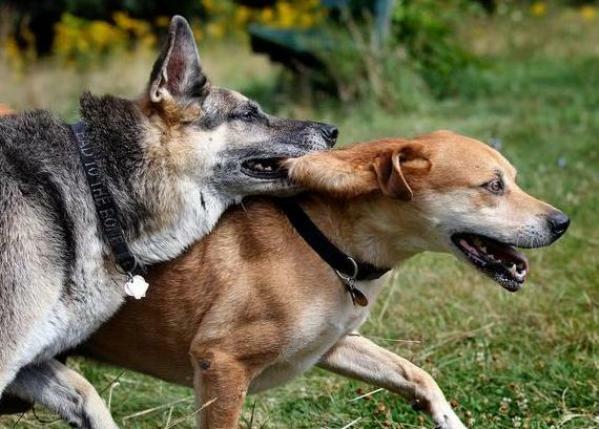 For the first time in 10 years, Hurricane and Storm were reunited at Forest Hills Park in East Cleveland this week. The Plain Dealer reports that Storm, now 11 years old, seemed to instantly recognize his old buddy. The two seniors spent half an hour playing and chasing each other around the park. The death of so many abandoned pets in the aftermath of Katrina who weren’t as fortunate as Hurricane and Storm, as well as the deaths of pet parents who refused to leave their loved ones behind, led to the passing of the Pets Evacuation and Transportation Standards Act (PETS Act) of 2006. This law requires shelters to be provided for people as well as pets after a disaster.